Home / Articles / Hop On Over! 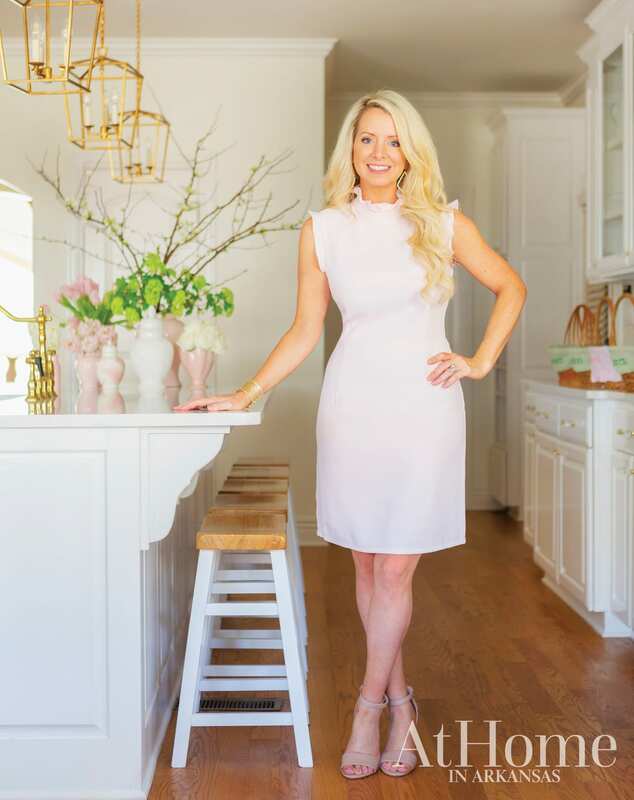 That’s when she started Maune Legacy, a blog where she shares lifestyle tips, party planning ideas, and home inspiration. “Growing up I wanted to be a photographer, an interior designer, and a party planner, plus I love to read and write. The blog has given me an opportunity for all of my passions to collide; I didn’t have to pick just one thing,” Jennifer says. In particular, she enjoys using the online platform to connect with other women and create content to inspire them in all areas of life. 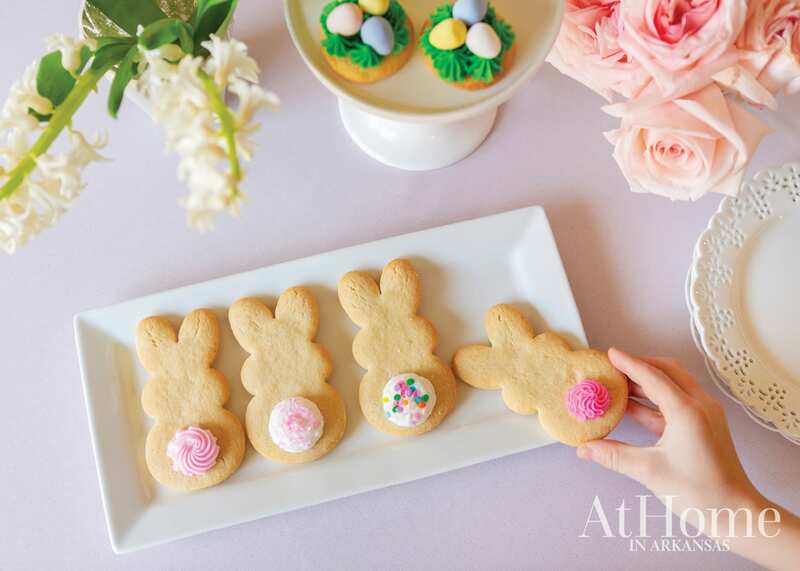 During the spring, her talents (and many of her blog posts) turn toward creating a memorable Easter holiday. For the past nine years she and her family have hosted a neighborhood egg hunt, complete with lots of treats and fun for little ones. And this year will be no different. Having moved into a new neighborhood in Little Rock, she’s eager to continue the tradition with new neighbors. 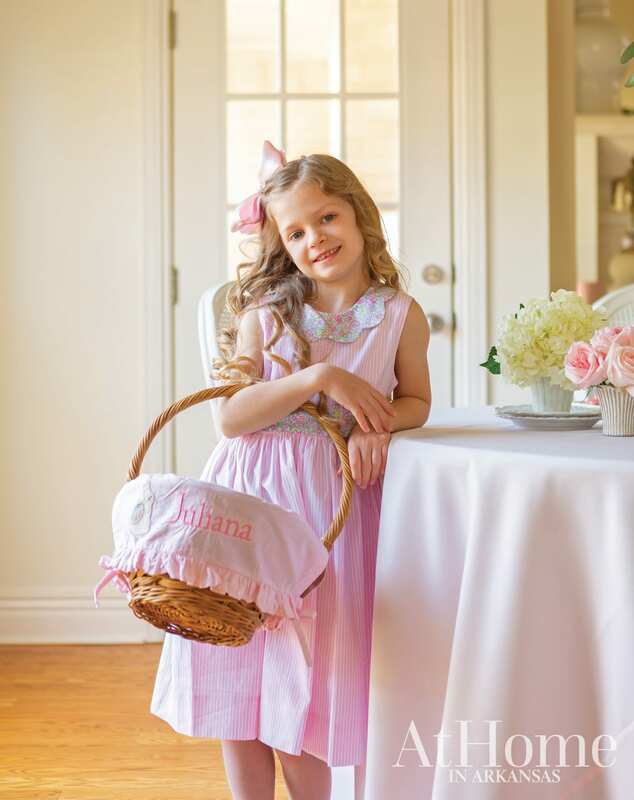 Here, she gives us a glimpse inside the preparations, a look at the sweets table, and, of course, a peek at her children’s matching outfits for the holiday. Floral designer Chris Norwood of Tipton & Hurst created an arrangement that requires no tabletop space. 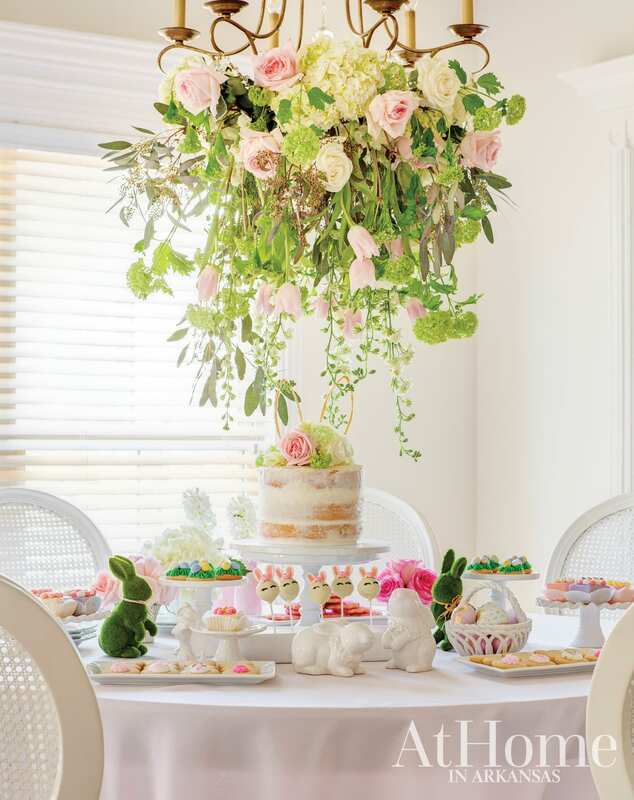 Using the chandelier as his “vessel,” he created an arrangement of pastel posies, including hydrangeas, viburnum, tulips, larkspur, seeded eucalyptus, ‘Casa Blanca’ white roses, and pink O’hara garden roses. 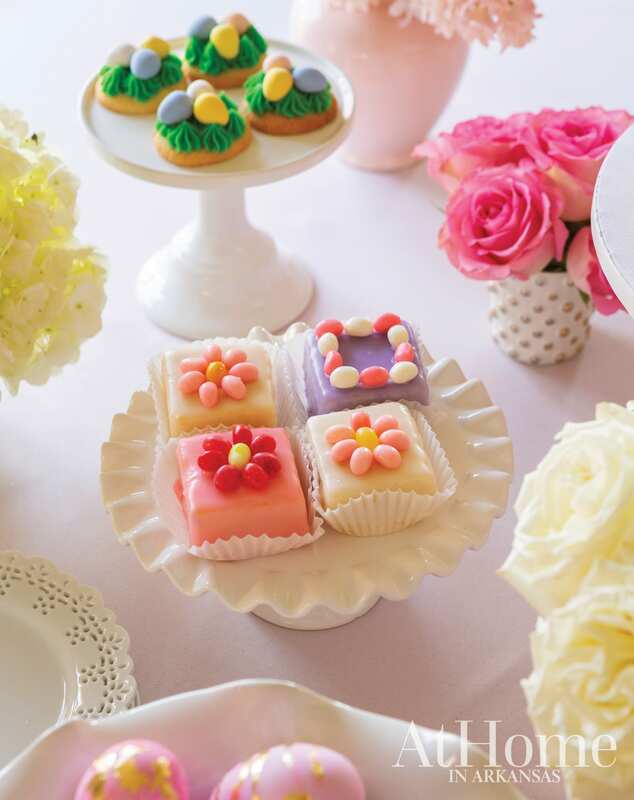 A bevy of desserts, all from Little Rock’s Community Bakery, lines the table for guests to enjoy during the party. 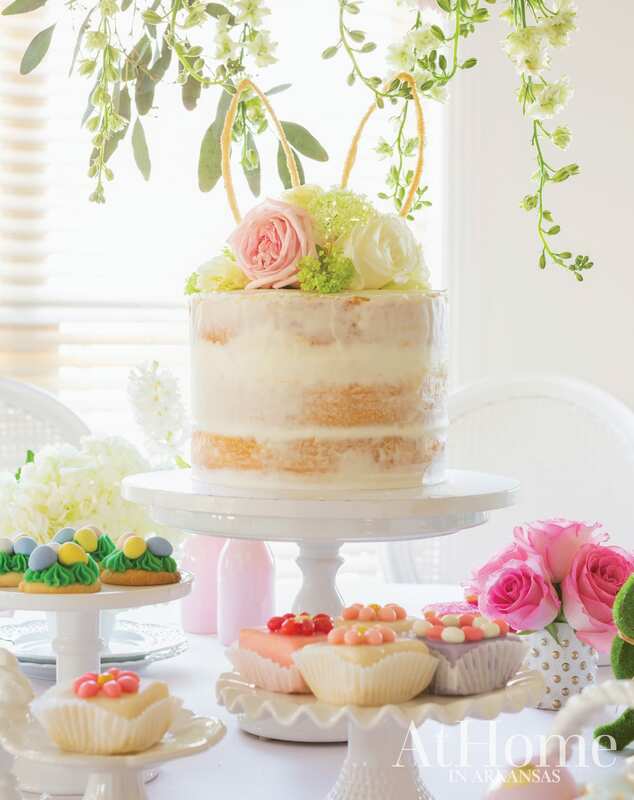 A naked cake, topped with fresh floral to match the chandelier’s arrangement, along with bunny-shaped cake pops, bunny tail cookies, Jelly Belly petit fours, and nest egg cookies play to the holiday’s theme while satisfying any sweet tooth. 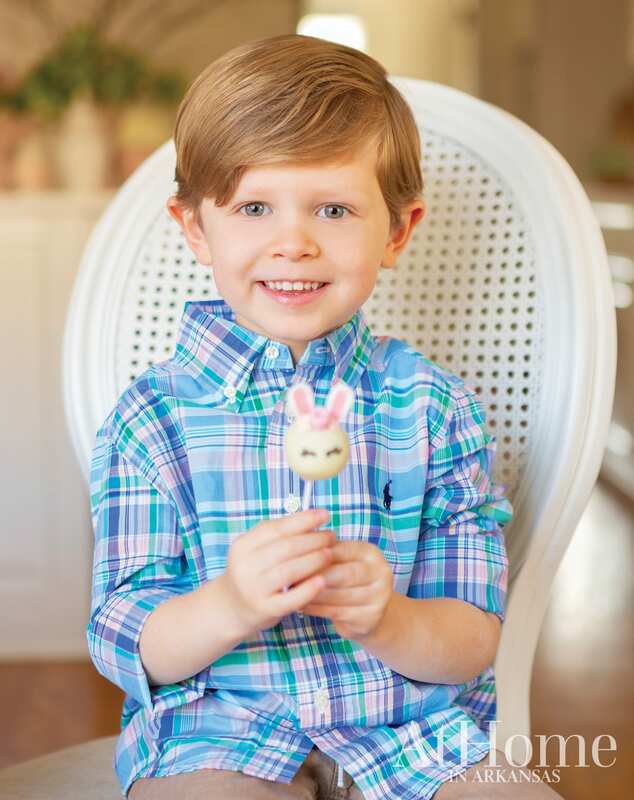 The Maunes’ son Warren enjoys a cake pop from the treat table. Two-year-old Vivian shares sweet kisses in her Easter best. 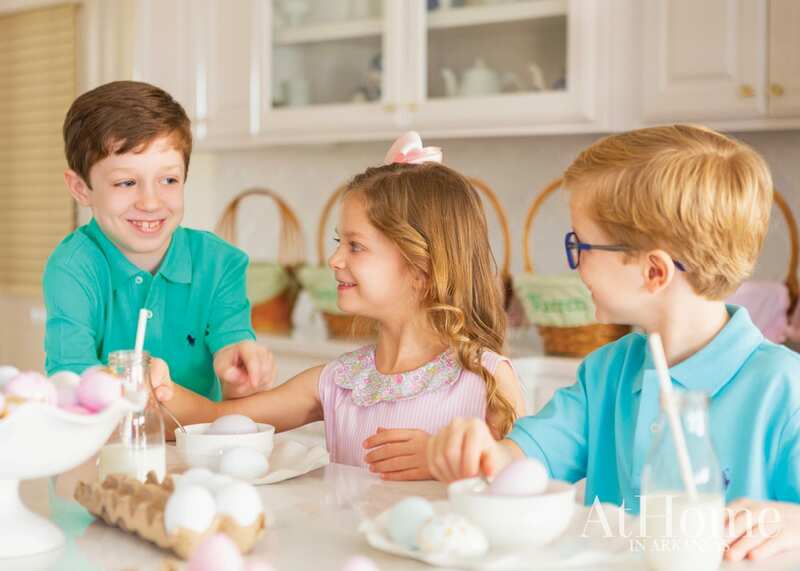 Bennett, Juliana, and Landon (seen left to right) help dye eggs and later add the gold-leaf foil for a fun twist on a traditional craft. Combine ½ cup boiling water, 1 teaspoon of vinegar, and 10-20 drops of desired food coloring in each container. Mix colors to create different variants. Soak a hard-boiled egg in the food coloring for 5 minutes. For lighter hues, reduce the amount of soaking time. For darker colors, increase it. Remove eggs and allow them to dry completely. 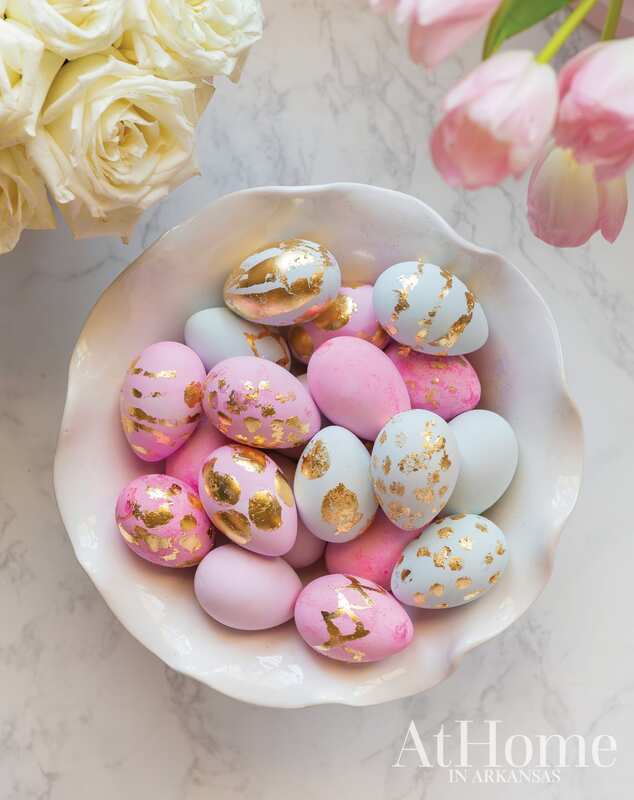 Using the gold-leaf glue and a paintbrush, paint your desired design on a dyed egg of your choice. Allow the glue to sit for 10 minutes or until it becomes tacky. Cover the design with the gold-leaf sheet, then carefully peel off the sheet to reveal your design in gold. Use a paintbrush to brush away any unwanted remnants.